Angie Olsen is a Piano teacher at Pianos n’ Pianos. We think our piano teachers are wonderful and want you to get to know them on a personal level. Below we talked with Angie. Check back soon for more PNP teacher interviews! Angie grew up in Salt Lake City Utah, where she first started playing the piano as a young girl. She moved to Colorado when she was a teenager and after being separated from her great piano teacher, she lost interest in playing the piano for a while. She continued to love creating music and in her 20s she played bass in an all original band. She had two young children at the time, and keeping up with the band’s gigs was difficult. So she broke away from the band and family became her priority. Angie worked as an accountant for many years after that, but music always remained a passion. About 10 years ago, she saw an ad that Ken Trujillo (owner of Pianos n’ Pianos) ran for a part-time piano teacher. He hired her for adult group lessons, and she learned his custom accelerated adult program. She highly respects his teaching method and started teaching one-on-one lessons through PNP. She has been teaching piano ever since and now collaborates with other teachers at PNP, and plans to do some performances and recitals in the near future. A: I started playing the piano when I was about 8 years old living in Salt Lake City Utah. My family would be watching TV or doing something else and I would go upstairs and play the piano instead. My grandma bought me my first piano. I practiced until I got to the level to play Beethoven’s Moonlight Sonata original composition. I still love to play that one. I also loved to play a piece my grandfather gave me called Cordoba, by Isaac Albeniz. Q: What is your favorite song to play on the piano? A: The fun of playing is learning new music. So my favorite song to play is usually whatever I am working on at the time! I love learning and making new music. Q: What and where was the most beautiful piano you have ever played on? A: The coolest piano I have ever played on was an Imperial Grand Bösendorfer piano located in the King Center on the Auraria Campus Downtown Denver. What was unique about that piano, was in the very lowest register they added 8 extra strings to get even lower, broodier notes for the romantic composers (like Chopin). The 8 added keys were blacked out on the lowest end to distinguish them and not confuse a pianist in the peripheral. The exterior of the piano was glossy black with brass inside and gold trim. It was beautiful. I believe it is a permanent piece that they have stored on campus and pull out every once in a while for performances. It is not the typical piano that people would play, but it was very interesting. Q: How long have you been teaching piano lessons? A: I have been teaching for about 10 years now. I started teaching with PNP doing group lessons and then added individual lessons. I do a little composing on the side as well. Q: What is your teaching method? How do you feel about wrong notes, mistakes, and slow learners? A: I use a few different method books. When deciding which one to use during a lesson, I assess the age of the student and what they can absorb. I started supplementing their lessons by using a write-it-out method, where kids can take a few lines from a song they like and combine it with other songs. That way they can “compose” and be more invested in the music we are playing. If you play a wrong note, I tell my students to just keep going and to not lose concentration. Wrong notes happen sometimes. If you make a wrong note in a performance, you can’t stop, you just have to roll with it and keep going. I also encourage singing with the piano that helps learns pitches and notes! Q: Is there a perfect age to learn to play the piano? Are you ever too old/young? A: The youngest I have taught is about 6 years old. I wouldn’t recommend putting a child much younger in lessons. Most children that young don’t have the ability to sit for very long and play. When teaching young children, I make sure to give them variety and plan lessons only about 30 minutes long. For older learner, it is very good to play piano to keep the mind active and sharp. So really any age, 6 and up, is a good age! Q: What is the best thing about working for Pianos n’ Pianos? A: The best thing for me is that the people at Pianos n’ Pianos are like a second family to me. The owners, Ken and Peggy, are such awesome people. Ken is a true professional, knows the business inside and out, and he keeps the pianos in such pristine condition, they are so wonderful to play on for lessons. I love the people and the atmosphere and just being surrounded by pianos everyday! I couldn’t really ask for more. Angie teaches in the PNP studio on Fridays and Thursdays and also gives private in-home lessons the rest of the week. If you are interested in taking lessons with Angie, please contact Pianos n’ Pianos and we will coordinate with you! In the spotlight: Pianos n’ Pianos’ Irina Manasyan. Pianos n’ Pianos is pleased to announce a wonderful new addition to our piano teacher roster, Irina Manasyan. Irina Manasyan has a degree in Piano Performance and Pedagogy and 39 years of successful teaching experience in classical piano performance and theory with children and adults. Irina is an accomplished pianist and accompanist. She has been featured in numerous solo piano performances and also performed with various chamber orchestras in U.S., Russia and Armenia. Ms. Manasyan is trilingual, fluently speaking English, Russian and Armenian. Irina Manasyan offers a coordinated approach to piano instruction for novice and intermediate students as well as systematic professional training for advanced students and adults. Her teaching practice is based on a synthesis of methods of world-renowned piano schools. Some of Irina’s favorite composers are Chopin, Katchaturian, and Mozart; however Irina teaches whatever the student wants to play, including very contemporary composers, so that student enjoyment is maximized. Ms. Manasyan is an active member of MTNA (Music Teachers National Association) and provides access to opportunities for annual performances in competitions and festivals. 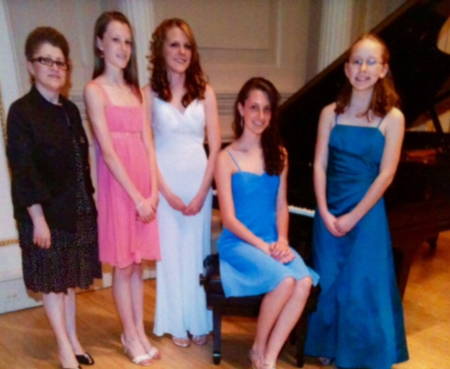 Irina’s students receive a comprehensive music education–both piano performance and theory. 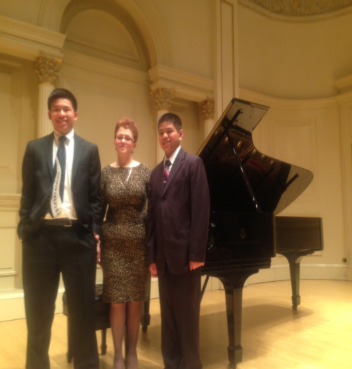 Her students have consistently been annual prize winners at Carnegie Hall competitions as well as University and Performance Arts across Pennsylvania. In addition, her students participated in a Certificate of Merit Program, which was and is sponsored by Music Teachers National Association (MTNA). This valuable program evaluates a student’s progress and skill in performance, ear training, sight reading and written theory. 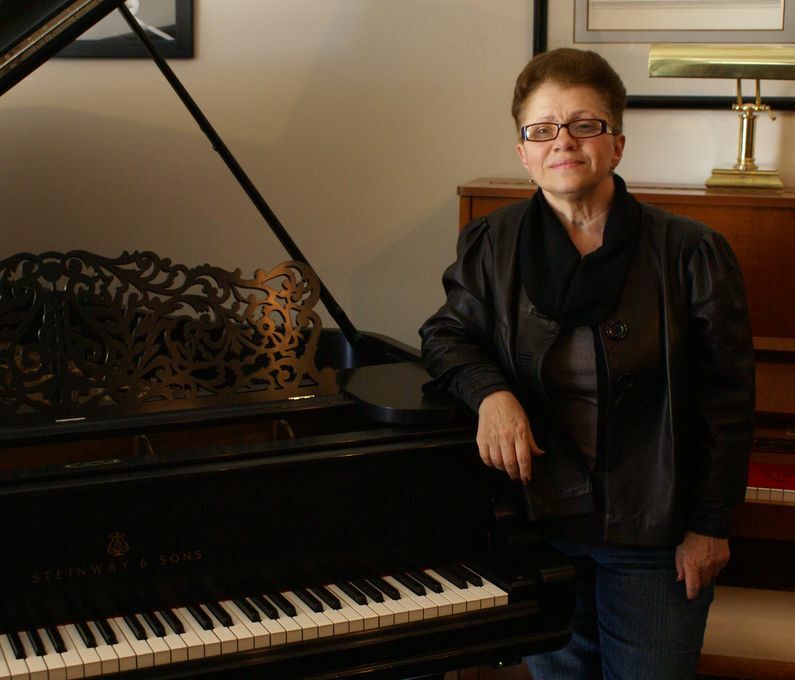 In the spotlight: Pianos n’ Pianos’ Penny Moeller. Penny is a highly qualified and gifted teacher who gives private lessons to children and adults at Pianos n’ Pianos. Penny has a B.A. in Music Theory from CU Boulder, and has an M.A. in Psychology from Antioch University. Her psychology degree explains why she is uncommonly adept at working with very young children. Penny holds certification in Creative Arts Therapy from the Creative Arts Therapy Institute Orff Schulwerk Workshops. In addition to teaching, Penny has performed as a pianist and accompanist with a number of Denver area theater and ballet organizations, including the Eden Theatrical Institute the Council for Self Development, the Cleo Parker Robinson Dance School, and Ballet Arts. Penny also plays regularly for churches. Penny also composes and arranges, and participates in numerous piano teacher workshops, continuously honing her skills. Penny is a Colorado native, born in Denver. Penny says music was very important to her Dad, and she inherited her love of music from him. Penny started teaching while in college as a practice teacher for two sisters. Penny realized that she had a gift for teaching when the sisters’ mother happily reported that the sisters were doing much better at their lessons. Penny has also used her psychology degree, working in the human services field at an adoption agency. Penny went on to adopt her daughter Emily, now 14. Penny enjoys playing with her cat Sammy and listening to music. She enjoys the music Emily listens to, and usually doesn’t change the radio station when Emily gets out of the car. But Penny also likes classical music, particularly Beethoven. 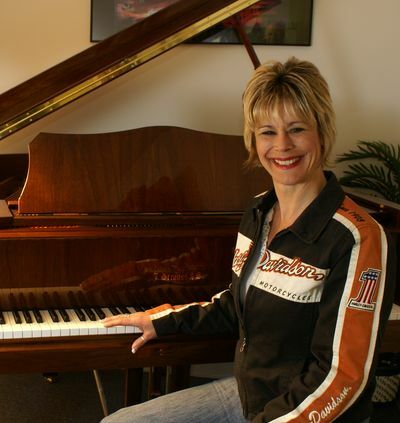 In the spotlight: Pianos n’ Pianos’ Lisa Seigler. Lisa hails originally from Chicago IL and later from San Jose CA, and now lives in Conifer, CO. Lisa gives private piano lessons as well as teaching the “Learn to Play the Piano in 8 Weeks” group lesson series at Pianos n’ Pianos. Lisa is an avid motorcycle aficionado. Lisa got her start with a motocross dirt bike, but now does mostly road biking. She is currently an officer of the Denver chapter of the Hog Motorcycle Club, and is looking forward to summer when she can ride her Harley from the mountains more often. She usually greets her piano students wearing tight blue jeans and leather jacket emblazoned with the Harley Davidson logo. Lisa also loves other outdoor activities such as camping and boating. Lisa is a second-generation piano teacher: her mother taught piano. But Lisa’s love of the piano wasn’t from the start. She started at 5 years old taking lessons from family and friends, but admits that it was “awful! I was bored to death.” This was because of the prevailing teaching methods of the time. When Lisa started college at San Jose State she majored in Psychology. She wanted to be a forensic psychologist or a FBI investigator. 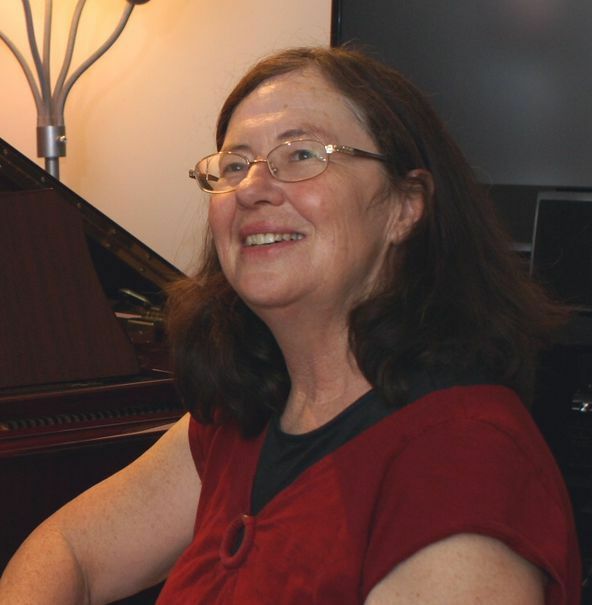 But she decided to start teaching piano to cover her school expenses, and it was then and because of her past that she decided she didn’t want any of her students to experience what she had gone through–she wanted the piano to be fun! And now all of her students agree that she has succeeded in this. Lisa has now been teaching children and adults for over 20 years. Lisa loves and teaches a wide variety of musical genres and styles. She particularly loves classical, pops, and show tunes. She likes to teach students of all ages and musical tastes. She says she prefers “anybody who likes to learn.” Her goal is to instill a love of music, to share the enjoyment of learning, and above all to have fun! Lisa tailors her lessons to fit each student’s needs, incorporating music theory and technique using traditional teaching methods as well as the Quick Chord method. Our students love Lisa and learn quickly under her tutelage. 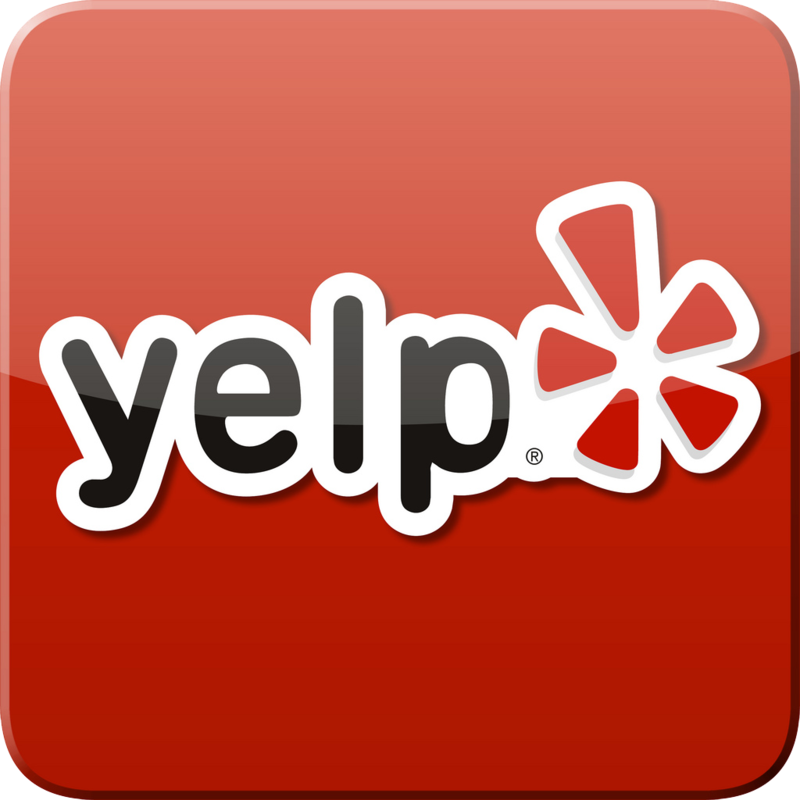 You can call Pianos n’ Pianos at 303-933-9390 if you have questions about Lisa or would like to schedule a lesson appointment.